As a rule I don’t read Doctor Who novels. I enjoy (mostly) the new series, and I loved the old series when the PBS station in St. Louis aired them when I was a kid. When I was that kid, I got a three-in-one volume of the Fourth Doctor’s (my favorite’s) adventures written by Terry Nation from the Science Fiction Book Club, and I know (but can’t remember the titles) of a few other novelizations I read. I can’t say that I ever acquired a taste for them, however. Certainly not one that equaled my youthful quest to get all the Star Trek novels (this was pre-TNG so the goal was within the realm of possibility at the time). So why this particular Whovian tome? Number one, it’s based on Douglas Adams's script and notes, and, number two, it concerns the Fourth Doctor (admittedly post-Sarah Jane but still pre-Adric). And I enjoyed it. It was a pleasurable way to kill a few lunch hours and before-bedtime moments. Admittedly, it tended to read more like a script than a novel at times but if you’re a true Who fan you don’t need much character build up anyway. You already know what to expect. The adventure was sufficiently universe-threatening and the villain, Skagra, was one of the series’ more interesting. 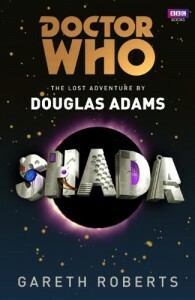 I wasn’t quite sold on how The Doctor managed to take control of Skagra’s ship (I won’t spoil it further than that) but aside from that quibble, I found the escapades and death-defying escapes no more outrageous than any other episode and fun to read. And there’s a backhanded homage to Adams, when Prof. Chronotis explains that when he stole The Worshipful and Ancient Law of Gallifrey he replaced it with a copy of The Hitchhiker's Guide to the Galaxy, which had a remarkably similar cover. In sum, if you’re a DW fan, you’ll like this book; if not, don’t read it (or, if you do, prepare to be lost pretty much from page one since a fully grounded Whovian background is assumed).